North Korea recently conducted a test of an ejection launcher that U.S. intelligence agencies assess is part of Pyongyang’s recently discovered submarine-launched ballistic missile program. The test simulated the initial stage of boosting a missile out of a submarine launch tube and is a sign that the rogue state is moving ahead with plans for underwater missile strike capabilities for a future nuclear-tipped missile, said defense officials. U.S. intelligence agencies observed the land-based test of the ejection launcher in late October at a facility known to be a key development center for the communist state’s submarine-launched ballistic missile (SLBM) program, according to two officials with access to intelligence reports. The launcher also could be used by North Korea to launch ballistic or cruise missiles from the deck of a freighter or other kinds of surface vessels. A Pentagon spokesman declined to comment on the ejection test, citing a policy of not discussing intelligence matters. The Washington Free Beacon first reported in August that North Korea had launched a program to develop ballistic missile submarines. The program remains clouded in secrecy. 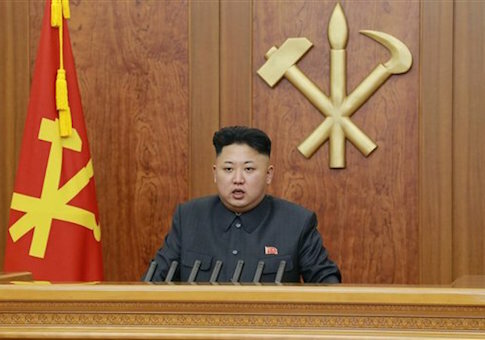 North Korea’s government has not responded to reports of the program. The officials said the land-based test took place at a facility in Sinpo, along the central part of the west coast of North Korea. 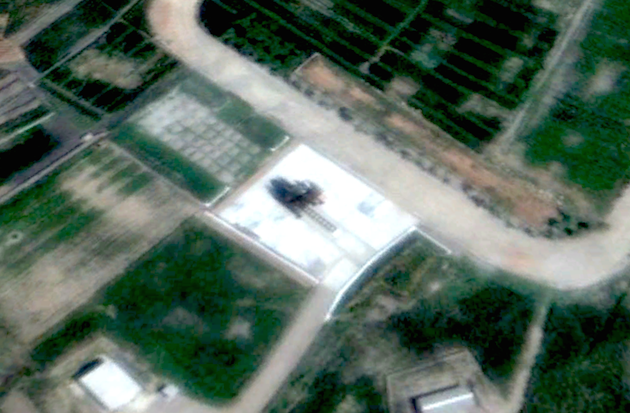 Google Earth satellite imagery of the Sinpo South Shipyard has revealed a testing stand at the site that military analysts say is part of a new submarine missile program. 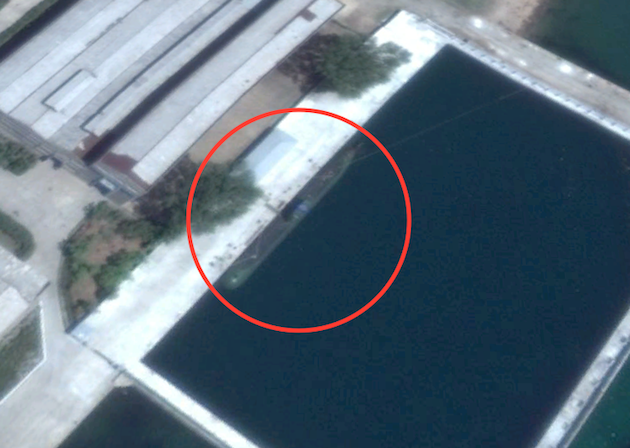 The Sinpo launcher is located close to a new North Korean submarine photographed at a nearby dock. The test launcher and sub were first disclosed by Joseph Bermudez, a specialist on the North Korean military. The semi-official South Korean news agency Yonhap, quoting government sources, stated earlier this month that North Korea has begun refurbishing a Soviet-era Golf-class diesel submarine capable of firing three missiles. The news agency report said the refurbishment is part of the North’s secret missile submarine program at Sinpo. North Korea "is believed to have completed construction of the new submarine after importing a Soviet-era Golf-class diesel submarine and reverse-engineering it," the South Korean government source told Yonhap. "The new submarine is 67 meters long with a beam of 6.6 meters, and has a dived displacement in the 3,000-ton range," the source said, adding that the new submarine was disclosed in a report by the U.S. online newsletter 38 North to be docked at the Sinpo facility where the test launcher was seen. The South Koreans believe the North will require "dozens" of tests over two years before deploying the missile submarine. North Korea acquired Golf submarines in the 1990s that were supposed to be used for scrap metal. It now appears they were reverse engineered. U.S. intelligence agencies several years ago reported that North Korea acquired SS-N-6 SLBM missiles covertly from Russia. That missile was adapted by the North Koreans into a new intermediate-range ballistic missile. The missile was designed to be ejected from a submarine launch tube prior to ignition. The Pentagon’s annual report to Congress on North Korea’s military said Pyongyang uses its large missile force as part of a strategy of coercion, despite its current peace offensive in the region. "North Korea’s stated intent to advance its nuclear program and continue ballistic missile/space launch vehicle efforts implies that it will eventually return to coercive actions to achieve its goals in the future," the report, produced in March, stated. North Korea recently raised the status of its Strategic Rocket Forces (SRF), which is in charge of missile and nuclear forces, to levels equal to its Army and Air Force, and the government has said the long-range goal is to attack the United States, the report said. "In March 2013, North Korea made the SRF the focus of its threat to launch a nuclear attack on U.S. and ROK targets," the report said. "The targets included the U.S. mainland, Hawaii, Guam, U.S. bases in the ROK, and the ROK President’s residence." The development of nuclear missile capabilities is being carried out despite resource shortages, and the pace of development will depend on the amount of foreign technology and other aid the North Koreans obtain from abroad. China has been a major supplier of both technology and materials for North Korea’s missile program. Beijing supplied North Korea with missile transporter-erector launchers that are now used for six KN-08 road-mobile ICBMs. Bruce Bechtol, a former intelligence official who specializes in North Korea, said the ejection test shows the missile submarine program is advancing. "It is very unusual for a country like North Korea to be interested in this kind of sophisticated technology," said Bechtol, a professor at Angelo State University in Texas. "Nevertheless, the evidence certainly suggests that they have acquired a submarine capable of launching an SLBM, and are now testing the missile that would potentially be launched from this submarine." A submarine missile capability would allow North Korea to launch strikes from either coast of the United States or against Alaska and Hawaii, Bechtol said, noting that because of the technical challenges it could take many years before the North Koreans will actually field a missile submarine. "Of course, if foreigners are in fact helping them to develop this system—such as the Russians—that time table could be moved up considerably," he said. Bechtol said the most likely warhead for the missile would be nuclear, something the North Koreans appear to be capable of doing with the medium-range Nodong missile. "There is no evidence to suggest that they can do this with any other kind of ballistic missile—at least not yet," he said. "One would think that if North Korea is going to go to all of the trouble to develop an SLBM—and the submarine to launch it—that they would also be working on the technology to match a nuclear warhead with the missile. Rick Fisher, a military analyst with the International Assessment and Strategy Center, said North Korea’s submarine launched missile program is disturbing. However, "questions remain regarding its potential capability," Fisher said. "Is it liquid or solid fueled? That may have a bearing on its size and payload. This, in turn, will affect the size of the submarine needed for transport." Fisher said a large canister-launched missile also could be fired from a surface ship. "North Korea has a fleet of bulk cargo and some container cargo ships that could be modified to conceal a large missile container," he said. "By using ship platforms for launching potentially nuclear warhead armed missiles, North Korea can greatly complicate the task of the defender."